No one knew exactly how Apple would reinvent the smartwatch game on Tuesday, but the iFaithful filed into Flint Center in Cupertino convinced that Apple would find a way. I’ll admit, after my disappointment with Android Wear, I hoped Cook & Co. had a few tricks up their sleeves as well. Despite skepticism that the Apple could no longer innovate without Steve Jobs at the helm, Apple managed to echo its success with the iPod, iPhone, and iPad, breathing a number of “why didn’t I think of that?” features into a new type of gadget struggling to take off. 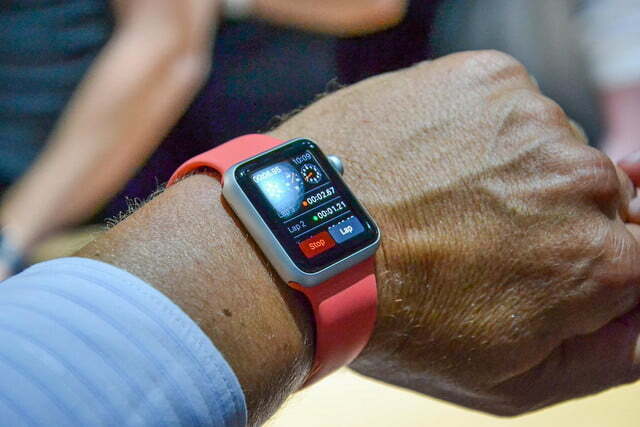 Will the Apple Watch finally give the wrist its due, and make smartwatches as ubiquitous as smartphones? We’ll find out in 2015. But in the meantime, there’s no question these features give it a huge lead over its confused competitors. Interacting with a touchscreen the size of a matchbook is an exercise in frustration. Mankind’s digits were not meant to jab at tiny buttons and text under glass. Google “solved” this problem by building Android Wear to primarily accept voice commands, but as it turns out, telling your watch “OK Google, remind me to pick up my rash cream” isn’t really a solution. 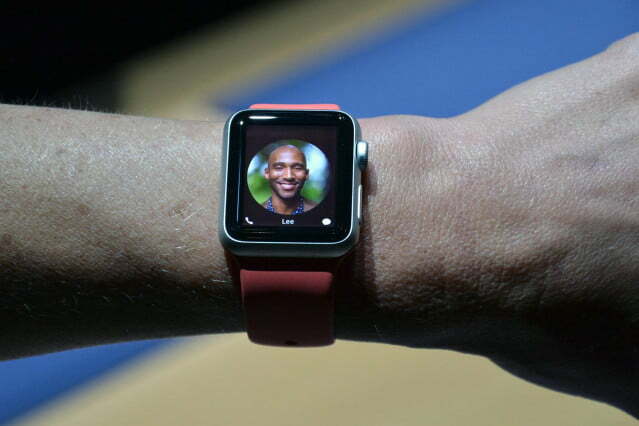 Apple lets you navigate the watch with a “digital crown,” an old-school solution to a distinctly modern problem. It’s a knob. You know, like the ones we’ve had on watches for decades. You can spin it to quickly cycle through options, and click it to select. Remind you of an iPod? While the screen is still physically small, you can use the wheel to zoom in and make options (like app icons) larger. Your phone may be a fashion statement, but it also hides in a pocket or purse 90 percent of the time, making an ugly phone bearable, if not ideal. The same cannot be said for a watch, which is on parade everywhere you wave your wrist. If you have to wear a brick on your wrist, you can at least make it yours. 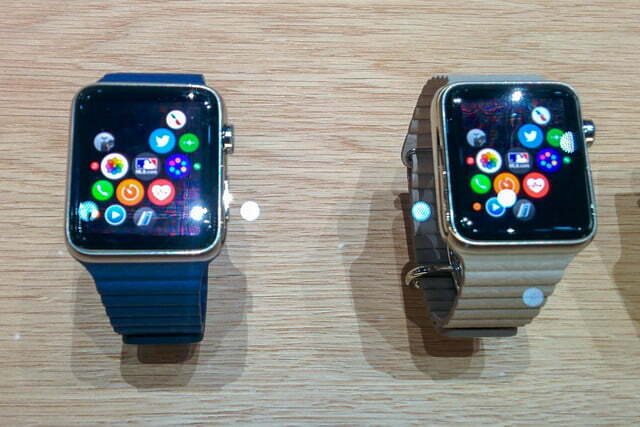 Let’s be honest: Apple’s fat slab of a watch is not a design anyone would opt for if all it did was tell time. But at least the company is giving consumers the opportunity to dress it up with three different finishes, two different sizes, and an endless variety of wristbands through aftermarket accessories. Which means if you have to wear a brick on your wrist, you can at least make it yours. A number of Android Wear watches – such as LG’s G Watch — also allow you to swap watch bands, but you’re stuck with one size and finish on the actual watch. Oh, and it’s hideous. Getting emails and text messages on your wrist remains one of the main selling points for a smartwatch, but when you wear one you realize just how impotent a watch really is: You have to pull out your phone to reply unless you want to bark commands into your wrist and see them butchered in the conversion to text. Point, defeated. Apple tries to remedy this with Smart Replies, which will analyze the text of a message and generate intelligent replies (like “yes” or “no”) that you can tap and send right from the watch. Does it work? We have no idea yet. Is it a genius idea? Absolutely. Excuse the embarrassing name, but Apple’s “Taptic Engine” isn’t just another vibration motor. All smartwatches will vibrate to let you know when you have an alert, but a constant buzz on your wrist will make you want to rip the damn distraction off by the end of the day. The Apple Watch delivers a far more discrete jolt, and isn’t audible to people around you. And it works. 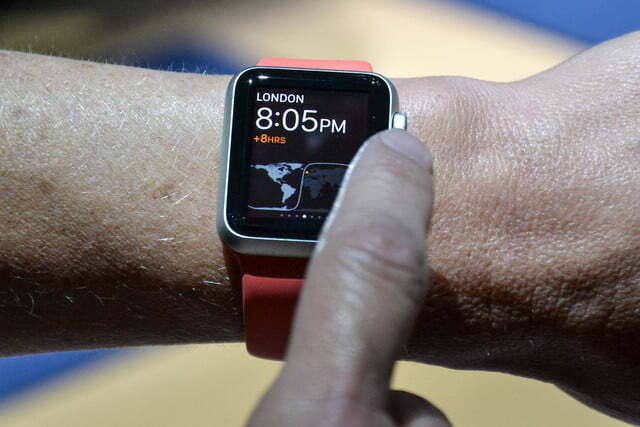 According to our hands-on correspondent, it feels just like a tap on the back of the wrist. Watches get banged up. Whether brushed against car keys or dropped onto concrete, they’re bound to endure plenty of abuse, and even the best Gorilla Glass screens will collect scratches with that kind of treatment. Apple took a page from Vertu’s playbook with the Apple Watch and used sapphire crystal for the screen, which is the most durable screen material in the biz right now. That’s something no other smartwatch can boast – something sensible, too. No smartwatch has conquered the battery problem yet: We’re still biting our nails as we watch their meters deplete through the day and anxiously charging them up every night. Since Apple made absolutely no mention of battery life, we can safely assume Apple’s Watch is no different (and based on the iPhone’s battery life, it may even be worse). 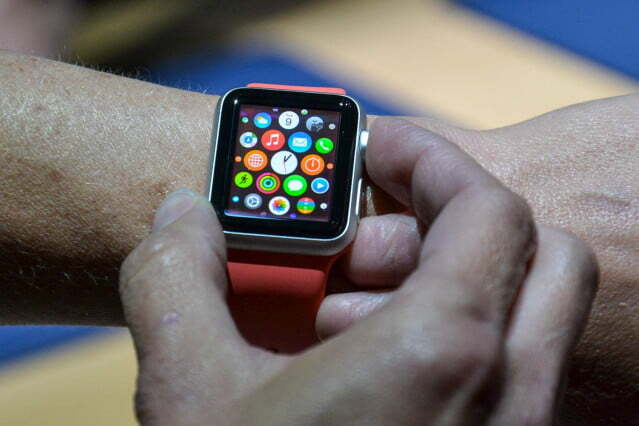 But the Apple Watch’s charger might make that end-of-night routine a bit more pleasant. Like Apple’s MagSafe laptop cables, it latches onto the watch with powerful magnetics, but there are no contacts involved; it uses wireless inductive charging instead. Compared to the annoyingly clingy cradle on Samsung smartwatches and too-loose model on LG’s, plugging your Apple Watch in nightly should be less of a chore … even if having to do it at still disappoints us.